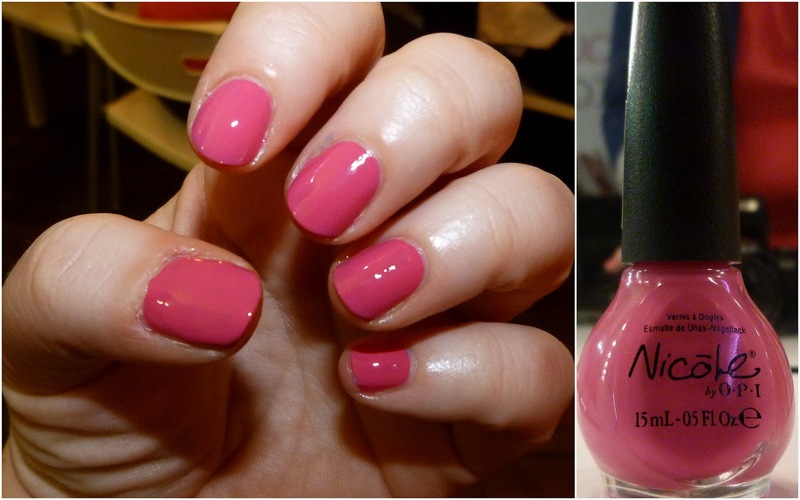 Nicole by OPI nail polish featuring the Kardashian Kolor collection! Yes, we're back with even more nail polish! New on the market in Ireland are the Nicole by OPI nail polishes and more specifically, the Kardashian Kolor nail polishes. At a blogger's event a couple of weeks ago, we had the chance to get our nails done and I zoned in on this bright bubblegum pink from the Kardashian Kolor collection called All Kendall-ed Up. I was given one in my goody bag, It Starts With Me, a stunning metallic colour that I made Joanne try on the following day. Part of the Liquid Metals collection from 2011, It Starts With Me is one of those colours that's hard to describe, not quite copper and not quite peach, with a touch of rose gold thrown in. These photos show the finish of three coats and this shade is nothing short of stunning. It sparkles but isn't gritty or glittery and it leaves your nails looking foiled and beautifully elegant. We love this a lot in the Lovely Girlie Bits household. I believe the Nicole by OPI polishes retail at €10.50. Just look at the polish in the bottle below, doesn't it look like liquid metal! Love these! The metal colour is amazing! Oh I'm well jel of your one,it's fab! So excited to see these hit the Irish market, at €10.50 they might seem steep but the formulation and colour pay off is second to none. Pishahh I say to your chippy €21 Chanel! I got a deep red, tis fabuloso - not really a Spring/Summer shade though. Red & silver leopard tootsies it is pour moi! Gorgeous shades, hate the Kardashians but like these! very shortly it will be well-known, due to its feature contents. Sally Hansen Airbrush Legs - get your legs out! We love J's Everyday Fashion! Dramatic eyes with just five products! Unexpected bargains are the best! My beautiful Inglot palette - photo heavy!